The St Francis Episcopal Church Anglican Rosary Service meets the first Wednesday of every month at 5:45 PM. The Rosary Service is coordinated by the Daughters of the King Women’s Group. Don’t know how to pray the rosary? We provide information. Scroll on down for some more information about Anglican Prayer beads. Everyone is welcome! The use of the rosary or prayer beads helps to bring us into contemplative state of meditative prayer—really thinking about and being mindful of praying, of being in the presence of God—by use of mind, body, and spirit. The touching of the fingers on each successive bead is an aid in keeping our mind from wandering, and the rhythm of the prayers leads us more readily into stillness. 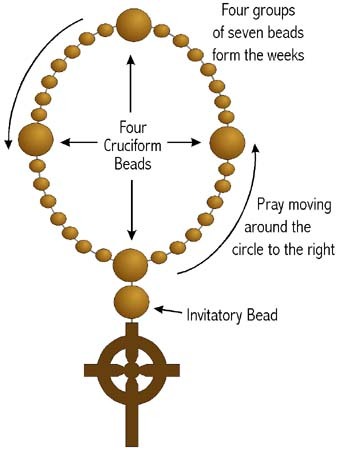 Symbolism of the BeadsThe configuration of the Anglican Prayer Beads relate contemplative prayer using the Rosary to many levels of traditional Christian symbolism. Contemplative prayer is enriched by these symbols whose purpose is always to focus and concentrate attention, allowing the one who prays to move more swiftly into the Presence of God. The prayer beads are made up of twenty-eight beads divided into four groups of seven called weeks. In the Judeo-Christian tradition the number seven represents spiritual perfection and completion. Between each week is a single bead, called a cruciform bead as the four beads form a cross. The invitatory bead between the cross and the wheel of beads brings the total to thirty-three, the number of years in Jesus’ earthly life. Almighty and merciful Lord, Father, Son, and Holy Spirit, bless us and keep us. Have mercy upon me (us).